I love to give out advice. I just can’t help myself. I give advice to the contestants on Wheel of Fortune ("Don't buy another vowel, stupid!") I give advice to perfect strangers on the freeway ("Hey, why don't you use a blinker once in a while?") I even give advice to The Donald ("Lose the comb-over!”) I give out so much free advice I figured I could be doing it for a living, so a few months ago I actually started running my own advice column in a little local neighborhood newspaper. 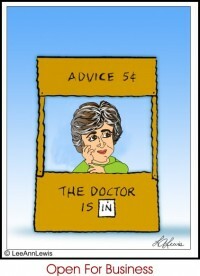 "After all", I thought to myself, "any idiot can write an advice column." I got a few requests for home cleaning remedies, which is a hoot considering the remnants of last week's spaghetti around my stove burners and the cobwebs dancing from my light fixtures. Still, as long as my readers couldn't see my filth, my credibility was safe. When I received a letter asking, "Dear Lee Ann, What's the best way to get the burned-on gunk out of my favorite roasting pan? Signed, Tried Everything", my response was, "Dear Tried, Cook an enormous ham in the roaster and take it over to a neighbor who is known for her housekeeping. She will no doubt return your pan to you cleaner than the day you bought it!" I liked the requests for parenting advice best because it gave me a chance to use my own experience. When a mom wrote complaining that her ten-year-old son kept her waiting in the car long after his basketball practice ended while he messed around in the gym with his friends, I passed along a trick I used when my own son Jason did the same thing. I kept a pair of old, dirty, fuzzy pink house slippers in the car at all times. Any time I was kept waiting, I put on those house slippers and went into the building after him. Take it from me, humiliation works! Occasionally I got a letter that really stumped me, like this one: "Dear Lee Ann, Help! My son's pet snake is stuck in the drainpipe of my dishwasher! What should I do? Signed, Frantic". Before answering her, I wrote off to other advice columnists for their suggestions. Dr. Phil said the snake represented something in the woman's childhood that is lodged in her subconscious. Dr. Laura chastised the woman for not owning up to her responsibility for the snake's predicament. Heloise suggested adding baking soda to the rinse cycle, and Ann Landers reprinted a poem about snakes that a reader had sent her thirty years ago. None of those seemed right so I told Frantic to release a white mouse in the dishwasher. I figured sooner or later the snake would come out for the tasty meal, and with a whole mouse lodged halfway down its gullet, the snake would be unable to return to the drainpipe. I had a lot of fun giving advice at first, but gradually the column began to get to me. I lay awake at night and worried. What if Afflicted had a relapse of Botrytis? What if Tried Everything’s neighbor returned the roasting pan in worse condition than she found it? What if the poor woman wearing old, dirty, fuzzy pink house slippers accidentally locked herself out of her car? And worst of all, what if the snake in Frantic's dishwasher ended up mating with the white mouse and having hundreds of snake-mouse babies? It would be ALL MY FAULT! Finally I couldn't take the pressure any more. Maybe any idiot could write an advice column, but this idiot wasn't going to do it any more. I gave up the column. I still give out free advice of course, but now I have an even better forum. I do it all day every day, and I never have to worry about painful repercussions. How do I manage it? It's simple. I only give advice to my family...and they never listen to a word I say! Search for No One You Know articles similar to "Free Advice on Giving Free Advice. Search all articles similar to "Free Advice on Giving Free Advice".